How can your ecommerce store use urgency – aka the fear of missing out or FOMO – to increase conversion rates? All’s well and good if you have limited inventory – you can just use your inventory management / order management system to specify how few products are left, on product detail pages. But what if you have a large stock of goods, or the type of goods that doesn’t change much seasonally (e.g. microwave ovens)? What can you do to get the conversion now and avoid a delay in purchasing — which often just means no purchase at all? Here are three techniques to create urgency and close the sale now. When you launch a new product line, a new store, service, feature etc – it’s important to get the word out. People understand this concept, so provided that it applies, you can announce your sale for opening weekend, or for the first month etc. Keep in mind that to maintain your credibility, the “introductory pricing” can’t last too long or you’ll hurt your value perception and not achieve the feeling of urgency that boosts conversions. I noticed such a negative impact on value perception with a local brand orange juice that was introduced at the supermarket for 30%-40% less than competitors. The supermarkets eventually raised the price to only be 25% off, but after a brief period within 10-15% off, they returned to 25% off. It appears that people got used to the discount and preferred the ‘better’ brands of orange juice when the difference in price was less marked. If your offer is linked to an external event – like the start of a course or the arrival of a holiday, you can use that to introduce urgency. Back to school shopping is obviously urgent because, well, kids need school supplies before they return to school! Another example is that retailers can state a deadline by which customers must order to ensure that the product arrives on time (e.g. before Thanksgiving). There’s a variation on this, which is applicable year-round. Invite visitors to buy before a certain time, to get the product shipped that same day and save themselves a day of waiting. This sort of event driven deadline is plausible and has the added benefit of relating to customers’ goals, i.e. have the gift in time for the occasion. Another twist on this is with a reverse-inventory system practiced by some retailers, where products are only ordered from wholesalers after the retailer sells them. You can see this in some discount clubs or crowd-funding on platforms like Kickstarter. Buyers must buy before the deadline, because the order eventually has to be sent to the suuplier. They’ll only send a bulk order, and not tack on another unit two weeks later. When supply decreases or demand grows, there’s an increase in price. That’s economics 101 – the law of supply and demand. So what happens if you get a big boost in traffic, such as from success with public relations, social media outreach to big stars, or you simply intend to launch a big ad campaign? In economic terms, that’s a big increase in demand. AkA a reason for the price to go up. At that point, you can email your client list to ‘warn’ them about the impending rise in prices. As a favor to your newsletter subscribers, you’d like to give them a last opportunity to buy at the current price before the price goes up. Telling visitors about the high demand for your product and possible waiting times is another effective urgency-builder. 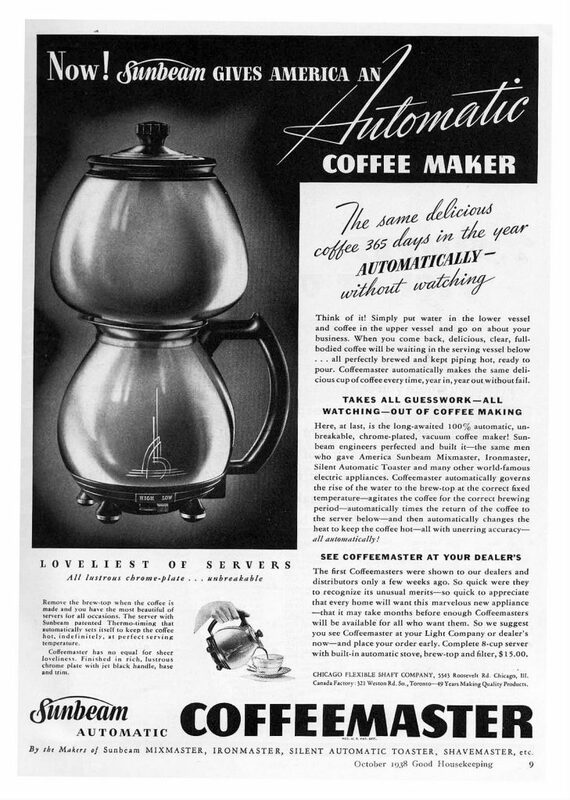 These coffeemaker ads from 1938 sold countless machines, partly thanks to this tactic. Another variation on this is if you’re making your product more valuable with a new feature, then it’s legitimate to charge more. Offer ‘old pricing’ until a certain deadline. 1) Offer introductory pricing for a new product, line, service, store etc. We’re excited to launch! 3) Tell existing customers or leads that the price is going up soon because demand is increasing. Click here for additional conversion rate optimization resources, such as my guide to getting usability testing done at 70% off the price of sites like UserTesting.com, or my 8-point cheat sheet to the optimal mobile checkout. We respect your privacy. Your email won't be sold or shared with anyone. In this remarkable interview with Karthik Chidambaram, founder of Magento agency DCKAP, I got some remarkable insights into how they improved the conversion rates and organic traffic for their clients. If you’re a developer who wants to add more value to your clients, you can subscribe to their blog newsletter, which shares solutions to problems they experience in their work. For example, check out their tips for creating Magento extensions. And if you’re into ecommerce, you may want to also check out our mobile checkout worksheet and ecommerce conversion services. Do you have a case study on conversion rate optimization or other digital marketing channels that you’d like to share? Contact me and suggest it. Mark Lavelle, the friendly and approachable CEO of Magento, gave me a half hour of his time at their Magento Live UK show! Not at all expected for the CEO of such a large company and at a packed trade show, to boot. – Transacting beyond just the ecommerce site/app: where’s the future of ecommerce going? For those of you interested in the slides from my talk – How To Preserve Your Conversion Rate While Going Through A Site Redesign – you can get them on my page about Magento Live UK 2016. And if you’re an ecommerce store that needs to increase its conversion rate, have a look at my conversion rate services for ecommerce and contact me. Gab Goldenberg: There you go. Cool. Hey, this is Gab Goldenberg. I’m live with Mark Lavelle. We’re at Magento live. For those of you guys who don’t know, Mark is the CEO of Magento, the world’s number one most popular eCommerce platform. Mark, thanks for joining me today. Mark Lavelle: Thanks, man. Thanks for coming to Magento live, UK. Gab Goldenberg: Absolutely, thanks for having me. Gab Goldenberg: I was just talking with Mark about how they recently sold the company from eBay to a private equity company and helping to focus and be very able to develop the community further and do things that are really helpful for Magento. Tell us a bit more about business strategy and where you guys are going from here. Mark Lavelle: Yeah, it was an important event. eBay-owned the business for about four years. When eBay and PayPal became two separate companies, Magento was offered as a private equity, because it wasn’t strategic any longer to PayPal or eBay. It had grown very well within eBay. We had invested a lot in the product strategy and ended up spinning out of eBay in November of last year. Since then, it’s been very much reestablishing Magento brand. The product is very known in the market. Getting sales and marketing going. You and I were talking about getting the marketing strategy right and developing leads. It’s a very organic business. As a result, we’ve got a wonderful network of system integration partners all across the world, technology partners. It’s a very partner-oriented business. Our job really, aside from that lead generation is to develop great products that our clients love. We work hand in hand with quite a number of folks outside the company. We also have a lot of internal RND resource. We launched recently, this has probably been our most exciting, ambitious product launch year ever. We launched today Magento 2 platform, which is a pretty large scale redevelopment of the original very popular one, platform. Launched that with great success. Been downloaded over 350,000 times. Gab Goldenberg: Yeah, 1,200 sites already launched on the new platform. Mark Lavelle: Yeah, this is amazing. Great reviews on it. We’ve already … We’re announcing soon the 2.1 version of it. We’re innovating very quickly on top of that platform. That’s all about scale, and performance, and enterprise, and extending the features that make Magento great, which is flexibility, being able to customize it. We launched a Magento cloud version, which was a public cloud management capability to provision, tunes, scale. We launched a new Magento marketplace, which is us standing behind the extensions of applications that are right now for Magento 2, but we’ll be expanding that. Gab Goldenberg: Yeah, that’s very valuable because, for example, one of the things people know about other marketplaces such as the app store through Apple, or the Google Android store, the common perception is that the Apple Store has quality, and that’s because it’s vetted, like what you’re talking about. With the Google store, there’s a lot more lower quality things. Mark Lavelle: Quality is really important in the extension market for a number of reasons. It’s quality, number one. Then, the other problem was duration of search, like telling the buyer who is interested in doing different visual merchandising, or CRM, or implementing the payment gateway, what choices should they make. It’s very hard for them to select between 27 payment gateways. Our job with marketplace is to ensure quality, ensure performance, and then help our merchant or our end user get the most out of the platform. That’s what marketplace is all about. Mark Lavelle: We also have released a SAS order management module that comes with Magento, that is critically more important as merchants get into more channels of demand than the consumer. I, as the consumer, may interact with your brand on your home page, or maybe on a mobile app, or maybe coming from Facebook, or maybe walking into your physical store. The contacts of that relationship is important to capture regardless of channel, because the fulfillment or the payment terms may be different. Helping optimize with inventory as well as with the demand is what that Magento order management platform is about. Gab Goldenberg: Exactly. It doesn’t help you if you’ve got the products in Glasgow if they are needed in London. Mark Lavelle: Exactly. You could perhaps get it to Glasgow. Maybe your buyer is in Glasgow, and you can actually run out across the street from them. That’s modern selling today, that awareness on the demand side, and the ability to satisfy that demand, or exceed your customer’s expectations by beginning to offer them unlimited inventory, and great fulfillment offers. That’s the business we’re in with the order management platform. It’s been exciting. Gab Goldenberg: You’ve been a successful entrepreneur with Magento, with Bill Me Later. What are some of the things that stand out to you as mistakes you’ve seen other entrepreneurs make? Maybe you’ve made yourself or you overcome. Some stories that really marked you as an entrepreneur that you think other people would benefit from hearing. Mark Lavelle: Well, I don’t know that I’ll give any more light than it’s the basics, right? You got to care about what you’re doing. You have to believe in what you’re doing, because it’s always going to be harder than you think, and it’s going to take longer than you think. I think I’ve learned that. In those dark days when things aren’t going well, you do it because you care about what you’re doing. Secondarily, it’s about the people. You’ve got to be doing it with people you care about and make you better. You get the right people around you that have competencies that extend yours. You work together well, and you all care about what you’re doing, then the execution becomes easier. Then getting through tough challenges, or crisis, or even thrilling things like hyper growth are more manageable. Then success is always a little bit of that plus luck. You can’t control everything. You can’t control the external environment. Gab Goldenberg: You started a dot.com company. That’s finished. That just died. Mark Lavelle: Yeah. Hang on, let’s start a consumer online payments company in 2000. We raised money, the 9/11 episode was tragic on a number of levels. We really formed our kind of thinking, like look, the privilege of building a company and being an entrepreneur is about freedom. It’s about getting passionately involved in something and being able to do it. We live in a society, thankfully, that allows us to take advantage of these things. You were talking about Tel Aviv and how vibrant that market is. I just really came to appreciate what a privilege it is to be able to take capital from investors and go build something with it. Gab Goldenberg: What gets you motivated? For some people, it’s just money, but I don’t think you build a big successful company like Bill Me Later, or like Magento just pursuing the money. What’s speaks to Mark Lavelle and your heart that makes you care about it? Mark Lavelle: Well, Magento specifically, I’m at a time in my career where I feel that giving back, helping people do the best work of their lives is what really kind of thrills me. You can find talented people, whether in the company or a partner, and you can set them up for success, that’s really motivating to me now. What I love about Magento is that’s essentially Magento’s business model is to help people achieve their dreams. We launched our Imagine show, an award called the Trailblazer Award, which is meant to really exemplify the eCommerce WP, or the innovation executive, the person that chooses Magento as a technology is not choosing technology. They’re choosing sort of an entire ecosystem that can help them accomplish what they want to accomplish. It’s not a far stretch to say Magento helps trailblazers accomplish their dreams. That really resonates with us. That’s why we’re here. Gab Goldenberg: Very neat. If we’re going to talk about the next six months for a year, what are some trends that you think are really developing quickly in the eCommerce world? Mobile is not a trend anymore, that’s something that’s presently existing. What’s the new mobile if you can identify it? Gab Goldenberg: Taken for granted. It’s just here. Mark Lavelle: You have to start with that. Your users are going to be on devices. They’re going to be on multiple devices. Gab Goldenberg: What’s new? Where are we going in eCommerce? Mark Lavelle: There’s a lot of talk about do you drive demand to your site in traditional ways, or do you put content in places where your customers is? I think that’s an interesting new thing that’s coming up. I think intellectually we believe that where people spend their time is where they will ultimately want to transact. They’re spending a lot of time on Facebook, they’re spending a lot of time on Messenger Applications, they’re spending a lot of time in social media. It follows that there’s some business eCommerce opportunity. They may want to discover items there. They may want to have business relations, service relationships in those context. That’s very exciting. I think we’re seeing the beginnings of it and we’ll see where it goes. Gab Goldenberg: That’s interesting. B-to-B is growing so much for Magento. Gab Goldenberg: What is driving all these B-to-B marketers and shops to come and rely on an eCommerce platform, which I think traditionally we’ve seen with B-to-C.
Mark Lavelle: Right. I think all the things that drove B to C are driving B to B. B to B has the same elements. They want duration, and they want their site or their products to look beautiful. They want their user to feel engaged. They want to reduce friction from the buying process. They want to spur re-buying. All of the things we talked about in B to C they’re doing B to B. The B to B buyer wants what B to C has, but they have special needs. They have special complexities, order volumes. Gab Goldenberg: Order volumes, businesses. Mark Lavelle: They’re don’t want to ship tomorrow, they want it shipped for the spring season. They don’t want one, they want a pallet. There’s a lot of complexities when you talk about B to B. The nuts and bolts of it are basically connect with the customer, engage the customer in the buying process, and exceed their expectations on fulfilling their demand and then get them back. Mark Lavelle: That’s where I think where it’s heading. We really see digital, the digital experience going everywhere in terms of we have universities, and hospitals, and financial services. Gab Goldenberg: It’s really remarkable how it’s expanded. Mark Lavelle: Yeah, it’s just a … I think we’re in a really exciting time to be in the business that you and I are in. Gab Goldenberg: That’s it. Mark, thank you so much. Mark Lavelle: Yes, it’s a pleasure meeting you. Gab Goldenberg: Good having you. Likewise. Mark Lavelle: Okay, take care. Gab Goldenberg: Do well. Take care guys. 1. The Magento Checkout Grader – it visits your site, adds a product to cart, goes to checkout, grades it and tells you how to improve. No more abandoned carts – yes to people completing the whole process as intended! Sign up to get access when it’s ready. 2. Similarly, but for mobile specifically: Get The Mobile Checkout Worksheet – Find mobile-specific opportunities to improve your checkout and save more sales from cart abandonment! Beyond my talk, I had a great time networking with folks and even had the privilege of speaking to the extremely approachable and friendly CEO of Magento – Mark Lavelle – in this interview. There’s a lot more to getting a redesign on your ecommerce store right than what I could share in the limited time I had. If you want a hand with improving your own store, please email me: Gab@ConversionRateOptimization.co with your site, your needs and your budget. The following common mistakes keep coming up in the inbound.org community’s super generous critiques of members’ landing pages. I’ve personally used some of these lessons to double my conversion rate. Your mileage may vary, but there’s a lot of potential in what’s written below. No. 1: Your headline copy does not convey the benefit of your offer. In David Ogilvy’s celebrated book, Confessions of An Advertising Man, he writes that once you’ve written your headline, you’ve spent 80 cents on your dollar. Let’s see how people mess this up. “Strengthen brand and make connections” is vague. What does this mean in terms of tangible, measurable and measurable?” says Joel Klettke, of Business Casual Copywriting, critiquing this landing page for a guide to LinkedIn company pages. Solution: Get potential customers to describe why someone should buy from you. Using your customers’ words, write your headline based on benefit to the customer. No. 2: Your writing is unclear. Solution: Have some friends sit down next to you and read your copy (preferably on the landing page itself, so they experience it laid out as visitors would) out loud, and paraphrase each line or two. You can also do this via 70% discounted usability testing on MTurk. Avoid clever copy and be specific. Solution: Have a single goal per page. Write just enough to persuade. Then stop. This customer service ebook (critique here) makes a simple conversion (name and email) complicated with excess copy. Look at how long it scrolls just for a simple click through button call to action! Conversely, if your product carries a high-price, you need longer copy than a cheap product. But even then the goal is only enough copy to persuade. Would you spend $1500 for a sales training system based on a headline, a one minute video and testimonial? Probably not. Most visitors to your page are going to understand things the same way. Is visitors’ understanding the same as yours? – Barry Buckman, of Ecommerce Innovators, commenting on this cleaning company’s page. Discover how others view your page using usability testing. See link in lesson 2 above for a guide to doing usability testing cheaply. – Barry Buckman on that same cleaning company’s critique (see #5 above). Tout what third parties have said about you, how much you’ve sold (number of units or customers) or famous customers. #7 – You Haven’t Done Your Market Research & Don’t Understand The Customer. I’m not going to share examples because it may embarass some folks. Buy Ash Maurya’s Running Lean and then devour Customer Dev Labs … Justin’s content is groundbreaking and extremely valuable, as a log of practical experience applying Running Lean. This experience-based talk on lean can also interest you. Apply their methods to interview potential customers and learn what their major pain points are. #8 – You Haven’t Addressed The Risk In Your Offer. You wouldn’t take a blood test unless the needle was new/sterile, would you? Why expect anything different from visitors? Ask yourself what do people have to lose by converting, then address that. Imagine if a gym offered shuttle service that picks you up at your door twice a week, addressing the big risk of not showing up. TheProspectingSystem (mentioned above in point 4) has a new homepage that uses lots of Inbound’s tips! For instance, it segments visitors. The table of contents’ modules are not loaded by default, but shown only if someone clicks to view them. Segmenting personalizes copy by allowing visitors to choose what to read. According to the book Honest Seduction, this can increase conversion up to 10x! Figure out what people care to find out, and give them links to those pages – within the main copy area – so they can find out more on their own and sell themselves on your offer. One common trick to lower conversion rates is causing the eye to flick between many loud visuals. It works a treat below! The practice: Start by designing for an old 320 pixels wide screen to force yourself to focus on the essentials. That’s actually my key tip for better homepage design. Convey your offer’s benefit in the headline. Write clearly, i.e. specifically and in terms everyone understands. Set one goal per page. Make copy proportional to the conversion you seek. Cause your site to work the way visitors understand it to work. Earn my trust with third party endorsements. Research your market’s problems and demographics. Eliminate or reverse the risk in your offer. Segment the traffic according to the visitors’ needs. Simplify the design by eliminating visual distractions. Here’s How Senator Cruz can get dramatically more donations, based on my 10 years’ experience in web marketing. Cruz supporter or campaign member? Please forward this to someone closer to those managing Ted’s website, so they can increase donations asap. If you’re part of the Cruz campaign and you’re reading this, I’d also love to consult for you on increasing your donations, volunteering commitments, email subscriptions and open rates etc. Please email me at Gab@ConversionRateOptimization.co or call 1-802-321-0111. To everyone else, if you’re looking for help with your charity or increasing your site’s conversion rates, please check out my services and contact me. Here are some tactics that I’d encourage the Ted Cruz for President campaign to adopt immediately, to maximize the conversion rate on their donation form. For example, you can use the Google Maps API or a zip code database to autofill the rest of the address once a person types in their street number or zip code. And you can order the donation amounts from highest-to-lowest, which provides a psychological frame of reference that can encourage larger avreage donations. If you’re part of the Cruz campaign and you’re reading this, I’d also love to consult for you on increasing your your donations, volunteering commitments, email subscriptions and open rates etc. Please email me at Gab@ConversionRateOptimization.co or call 1-802-321-0111 . In this remarkable interview, conversion and sales expert Keith Hagen shares the exact methods that his company – Conversion IQ, part of Inflow ecommerce marketing agency – used to achieve outstanding results for clients! As a quick preview, ConversionIQ increased one ecommerce site’s conversion rate by 207% and a lead generation site in the solar panel industry by 75%, which increased the public company’s stock price to an all-time high – while competitors sales floundered! If you guys are interested in some more thought leadership by Keith and gang, check out this free ebook they wrote on testing ecommerce properly! You’ll understand how to run ecommerce a/b tests better, for example by knowing ahead of time how long to run the test for and whether you should use your testing tool’s data or Google Analytics data. Here’s a little tip for a/b testing your lead generation forms on landing pages, contact pages, checkout processes etc: count unique visits to the thankyou page as your goal, rather than clicks on the form submission button (regardless of it being labelled ‘submit’ or something better). First, you might overlook counting some conversions. How can this goal miscounting happen, technically speaking? Some people zip through forms using tab and enter. They can submit the form by selecting the button with tab and then pressing enter on the keyboard. That won’t trigger a click to be measured in your a/b testing tool (I know, I’ve just been doing quality assurance on a contact page’s a/b test). So you’ve gotten a conversion, and it hasn’t been measured. The second reason is that you might count false conversions as real conversions if you just count clicks. For example, you might count form submissions with bad data, no data or unsuccessful attempts at form submission. How can this conversion miscalculation happen, technically speaking? Some form error checking methods depend on the data entered being checked after submission, while the thankyou page is loading. So you get the click and measure a conversion, but perhaps the data was bad or lacking and the visitor was just sent back to the form with no email sent to you nor lead entered in your database. Similarly, if you’re a bit more advanced and do in-line error checking and user notification, they may not notice the error message yet still click submit. Regardless of which stage the error is caught at – before they click submit or after – you’ve got no conversion to speak of but you’ve counted one. As an aside, this is why you ALWAYS need to do quality assurance testing on your a/b tests. At the very least, to catch errors in measurement and data collection so that your analysis down the line will make sense. Andreas Voniatis dug deep on stats to sculpt PageRank, and reaped 208% more SEO traffic for their enterprise client with a 68-position average ranking increase across 588 keywords. Besides for the remarkable case study, Andreas and I discussed the exact statistical approaches his SEO agency – Artios.io – uses to differentiate itself, and eliminate ego from SEO-implementation discussions. As a result, their clients are much likelier to implement Artios’ recommendations, rather than responding with something like “but expert A says blah blah blah” because it’s not this opinion or that one – these are the facts. The graph shows the height of the web page images for both sites and how they vary across the pages. The peaks represent the most frequent image heights for the two websites. One of the things we found quite interesting is that on average, the images on the T Plus are around 100 pixels compared to Goodshot which has image heights of ~270 pixels. Here we can see, both of these sites are have average image widths of just under 250 pixels although, Goodshot is much more varied with some images being as wide as 700 pixels. getting more shares on social media? ranking higher in Google i.e. SEO? Say SEO was important to you, one of the things you can do is plot the image sizes to see whether the image width shows a predictable relationship between you and your competitors in Google. As the graph above shows, the higher ranked leading competitors have larger images on average and should aim an image width of 275 pixels. The R-Squared statistic tells us what percentage the feature can explain the differences in Google ranking, making your SEO campaigns less of a guess and more predictable. It’s a step beyond correlation, with these maths looking at causation, aka the ability of a metric to explain a site’s ranking ability. In this interview with SaaS and conversion rate optimization expert Lincoln Murphy (Twitter, LinkedIn) of Sixteen Ventures, Lincoln shared 3 fascinating case studies as well as some great insights into how he thinks about helping SaaS customers get value from the software, with research into value events or milestones, getting free trials off on the right step and more. In particular, Lincoln shares a case study that has great relevance to lots of SaaS companies: how to reduce the time free trial customers take to convert to paid customers. The SaaS company he helped had a 30 day free trial… and on average that still didn’t suffice. People bought only 13 days after the end of the free trial, 43 days after signup! He helped them change their onboarding and selling so that it went down to a mere 3 days. Watch the video to learn how he did it! If you’re watching, you may be interested in conversion rate optimization services for SaaS, to maximize trials and paid conversions. Gab Goldenberg: Hey. This is Gab Goldenberg of conversionrateoptimization.co. I’m here with Lincoln Murphy of Sixteen Ventures, one of the world’s most followed SaaS consultants. The guy can help you with your onboarding, with your free trial conversion rates, with many more things. That’s what we’re going to be talking about today. Lincoln, thanks for joining me. Lincoln Murphy: Oh, absolutely. Thanks for having me. Gab Goldenberg: Yeah, for sure. Before we started this interview, I asked if you could share some things you’d like to talk about as well as some case studies. I have to say, there were some really remarkable things here. In particular, something that struck me, because I come from the world of search marketing, and I recently saw a case study where this guy in his very first year running a PPC agency took it from zero to two and a half million growth revenue in a year. I was like, “Wow. That’s crazy.” In this case study, the guy was talking about what was the secret to his success, something that will be very familiar to all of your SaaS followers, customer success, right? He was saying in those first two weeks, even in the first week, he wanted to get them big wins, and then that makes a happy customer, word of mouth, and it’s a virtuous cycle from there. You’ve got some very interesting case studies here about going, for example, from 43 days to conversion to three days to conversion on a 30-day free trial. That must do fantastic things for cash flow and for acquisition. That’s Vision6, if I understand right? Lincoln Murphy: That was an email marketing company in Australia. Gab Goldenberg: Okay. They are an email marketing company in Australia. How did you help them? What was the research? What can you tell us about that experiment? Lincoln Murphy: Yeah. This is a company that I worked with over the years, probably going on about five years, just off and on. This is one of those companies that … Really, email marketing is one of those categories, product categories, that a lot of companies are fairly similar. They all copy each other. I had the opportunity one year to work with seven or eight email marketing companies, and it was my first real opportunity to work with several companies in the same product category. Lincoln Murphy: … because that first vendor didn’t solve their problem or didn’t help them. Lincoln Murphy: They’re pretty similar, yeah. What that means is that something else is going on there. This is when I started to really understand this idea of a success gap. You talked about customer success. Customer success is when your customers achieve their desired outcome through their interactions with your company. Lincoln Murphy: The problem is, there are some products and some companies, that even if you use my product to the fullest, you do everything that the product does and you come out the other end, and I look at it from the vendor standpoint, and I say, “You’ve done everything,” no matter what, you may still not achieve your desired outcome. Lincoln Murphy: That’s a problem, right? Lincoln Murphy: There’s a gap between the functional use of your product and the end result. Gab Goldenberg: They’re measuring the events, but the success is not just oh, they used every feature, therefore they’re happy. Lincoln Murphy: Exactly. Why does that happen? Well, because you can go through, build a list, send email, have it opened and maybe even consumed in some way, clicks or whatever, but if you were trying to get more people to buy a product or come to an event and they didn’t, even though you functionally used the product, you still didn’t achieve that desired outcome. Lincoln Murphy: What I learned was we need to do a lot to bridge that success gap. Going back to this example of Vision6, what we said was okay. We know that customers are coming in from … A lot of customers are coming in from other products. We actually did some analysis, and we actually talked to customers, which is this crazy idea, talk to prospects. We talked to prospects, but we also talked to existing customers to find out where they come from. Then we can start to really understand. Okay. Maybe they’re all coming from a certain competitor, or maybe they’re coming from all over, but at least we know that they are coming from … They have experience, right? Gab Goldenberg: Right. They’re not brand newbies. Lincoln Murphy: Right. We went back and looked at the onboarding flow. The onboarding flow is very catered towards newbies and very just … There were a lot of barriers to somebody that maybe already knew what they were wanting to achieve. You said 43 days, and just let me be be clear on that. They have a 30-day free trial. Originally it was taking, on average, 43 days for a prospect to convert to a customer, and that’s a free trial. What does that mean? It means the trial would expire, and then they would start asking for the sale rather than doing it during the trial. On average, on about day 43, and sometimes later. We looked at everything. Some people converted early, obviously. This is an average. Some took forever. Lincoln Murphy: We were like, okay, that’s obviously not good. We went back and refactored the entire sign up process to say what does somebody who already has experience, already knows what their desired outcome is, which is they need to be able to send these emails and have the action that they want to occur take place. How could we get them there quicker? We really just redesigned everything, did a thing where you could go in … This was based, again, off of talking to customers about what they wanted to achieve quickly. What were the first things that you need to do here? I think just to take a little bit of a sidebar on that. I think sometimes we probably want to give our customers too much. There’s this concept in customer success called time to first value. Lincoln Murphy: It’s getting our customer to a point where they’ve achieved value quickly or they’ve achieved value for the first time or for the first time, they see the true value potential in your product outside of your sales and marketing. Gab Goldenberg: Right. They’ve been the use case. Lincoln Murphy: Right. Now, we know that time to first value is an important metric. Sometimes we as the vendor think of what value is in the wrong way. We think of it as this really big … Maybe the big concept where they use … We talked about with complete functional use of the product. They’ve done everything. If we understand our customers we go back and we talk to them, we understand their use case, we know where they’re coming from, we might realize that time to first value could be much shorter if we just changed our definition of what value is based on what they think. Lincoln Murphy: We are so often focused on what we think value is. With Vision6, we were able to say, no. They need to just be able to upload their list and send an email. In fact, they just need to be able to create an email, see how easy it is to do that within our tool, and then they need to upload their list. Then they can be off to the races. Lincoln Murphy: … without even logging in, without even creating an account. Gab Goldenberg: Oh, that’s clever, eliminating all the friction. That’s so smart. I like that. Gab Goldenberg: It’s not going to get opened. Gab Goldenberg: Sure. Happy to pay for it. Lincoln Murphy: … then we ask for the sale. That’s what … Being logical about it when we ask for the sale is huge. Gab Goldenberg: Exactly. Exactly. You talked about that in a recent article that you shared with me about upsell. I’d love to get to that. I want to talk about something you just brought up, and I think it’s so critical in SaaS, in conversion rate optimization, in basically every niche. As somebody who’s only really learned it and appreciated it in the past few years … Partly my own fault. I think partly because until lean came about, people were just clutching at straws and nobody really even knew to do it properly. Talk about interviewing customers and speaking to them. I would love to hear about your process. What are some of the questions you ask? How do you even reach out to people? Why do you think that people aren’t doing more of this? Is it the fear of rejection? I’m going to ask 100 people and five of them are going to say yes. I’m going to waste all that time that I reached out to the other 95 people. Five interviews. Is that really valuable? What are your thoughts on the customer research problems like that? Why don’t people do more of it? What are the questions that you ask? How do you get to those key insights? Lincoln Murphy: Why don’t people do it? I mean, I think it runs the gamut from not … I don’t know if people will readily admit this, but I think some people just don’t want to … They’re scared to talk to people. They’re scared to talk to customers. I think it also … Even in there, there’s a gradient. Some people just don’t want to have … They don’t want to talk to other people. Some don’t want to talk to those that could potentially turn them down. They fear that rejection. They don’t want to get feedback because … It could be that they don’t want to get the feedback because they don’t want to feel bad about what they’ve built, or they might think that the people giving them the feedback, what right do they have to give them the feedback? Lincoln Murphy: I’ve run into people that fit all those different categories. Gab Goldenberg: What do you think? Give me feedback. Right. Lincoln Murphy: Right. To get that and know that it’s not necessarily all going to be positive sounding. Gab Goldenberg: Yeah, it’s scary. Lincoln Murphy: Feedback is positive if you are taking it the right way. I think you’ve just got to get out of your own way and know that you have to build something that people would want. Let me be clear on that. I think this is where people can also get in trouble. Building something that people want or need is different than building what people ask for or what people say they need or want. This is going to your question about how do you ask the right questions? We’ve all heard that story about Henry Ford and asking people what they wanted, and they’d tell you a faster horse. Or how Steve Jobs never asked anybody what they wanted, and he just built something, and it changed the world. Lincoln Murphy: Okay. I think there’s some nuances in there, probably, right? Gab Goldenberg: Yeah. If I can share one. Steve Jobs is something … I don’t know how many people know, but before he came back to Apple, he launched a company with a lot of his own personal money that he made out of the first go round with Apple. I forget what the company was called, but he got his brightest engineers and designers and all that. I forget what the product was, but it was a total flop. Gab Goldenberg: The Next. Right. The iPhone was more of a success. There’s maybe some insights to be gleaned into maybe they were scratching their own itch or they got some other form of validation, but even a guy like Steve Jobs failed horribly with that. Go on. Lincoln Murphy: Sure. No, that’s awesome. Thank you for saying that, because I think we sometimes put people up on pedestals, and we don’t really … For that one thing they did, we don’t take into consideration that they probably had some flops. Next, by the way, actually ended up being part of the core of OS10. Lincoln Murphy: It lives on. Yeah. Lincoln Murphy: Yeah. We have to understand that even the best, even the people that are the most successful have had failures, and they tried things and they didn’t work. I think where I’m going with Steve Jobs there is that he maybe didn’t ask people, “Do you want an iPhone,” right? “Do you want this?” because we wouldn’t have wanted that. Maybe we would have wanted a smaller phone that just made better calls or whatever. What he did do was understood the customers, understood the market, better than we understood ourselves. He did that through, from what I understand, through a lot of direct research, through secondary research, through talking to people, and just really thinking about what could we want. He was a little bit visionary, and maybe you don’t have to be that way in terms of you’re building a b to b product in the project management space. You don’t have to sit around and meditate on what the big thing is five years from now, but you do. You should sit around and think about, based on my understanding of our customers, what would their desired outcome be? What is their desired outcome? What do they want to achieve, and how do they want to achieve it? Gab Goldenberg: Oh, sure. The job to be done framework. Lincoln Murphy: Now, I get a little bit … I get a little worried about that framework and frameworks in general. I say framework all the time. I build frameworks. I fear sometimes that they get a little bit almost religious, and you can’t move outside of them. I go all over the place with frameworks. Lincoln Murphy: Yeah. There’s a job to be done. There’s a thing that you’re trying to achieve, that your customer has to achieve. The thing is, though, they can achieve that probably in lots of different ways, right? They can buy your product. They can buy a competitive product. They can use an open source product. They could roll their own. They could outsource it. They could hire somebody. Whatever. As part of the desired outcome, there’s an appropriate experience. An appropriate experience is what basically says I have that job to be done. This is how I need to get it done. This is the experience that I want to have when I do that thing. That’s ultimately going to be the most important aspect. The job to be done, the thing that has to be done, the required outcome of your customer, that’s what gets you in the game. Lincoln Murphy: If you don’t meet that, right, if you can’t do that, then it’s a non-starter. That thing is what you have to accomplish. Gab Goldenberg: Can I ask you … Sorry. Lincoln Murphy: … you have to figure that out. Sorry. Gab Goldenberg: Going back to the Vision6 case study, and we’ll go on to another one in a moment. I’m a bit curious, because you brought up something that I think makes a lot of sense, right? Some people might be using email marketing say to get people registered for an event. Some people want to move products, right? E-commerce vendors, let’s say. From what I heard … Maybe I misunderstood … the value for Vision6 vendors was just shifting quickly from their existing or previous email marketing source, right? They exported the list, and they just want an easy import and easy “what you see is what you get” type visual editor or something like that. I guess, what did you find … If you can share. If you can’t, obviously I understand … was the value for them and … Yeah. I guess what was the value there for them? Lincoln Murphy: There’s the required outcome, right? The required outcome is that they … We needed a way to send email. Every other vendor does that. That’s what gets you in the game. In the email marketing space, I need to be able to upload a list and write an email and send it and track the metrics, and that’s it. Gab Goldenberg: I’m still sending bad emails ever since. Lincoln Murphy: Right. How do we help you send better emails? How do we help you do that quickly? Gab Goldenberg: I get it. Lincoln Murphy: … helping you … Yeah. It’s giving you an experience that’s appropriate to achieving that overall desired outcome. That’s the point. I think I might have missed that a little bit. Gab Goldenberg: You talked about it. I just missed it. I focused on the wrong place. Basically, helping them write emails that follow the better principles, the best practices, let’s say, of marketing and persuasion. Gab Goldenberg: Okay, cool. That’s clear. Lincoln Murphy: We have that ability, by the way. If you’re building a technology product and you’re just giving people the functional, what I would say is a crud app, right? Where you can just create … It’s basically a database UI. That’s it. That’s almost a non-starter these days, right? Lincoln Murphy: You need to be providing real value to your customers. A lot of times, especially the more niche you go, the more you are less of a software vendor, and the more of almost a trusted advisor. Gab Goldenberg: Right. It’s software as a service, literally. Lincoln Murphy: That’s a service. Gab Goldenberg: You’re replacing a consultant. Lincoln Murphy: Yeah. One of the reasons I got really excited about SaaS a long time ago was I actually came from the supply chain management world. I didn’t come from enterprise software. I came from network-centric business models, and I saw that one of the huge benefits of SaaS is the network-centricity, the fact that we’re all using the same system. Lincoln Murphy: Now, I was a little bit early in that and the technology and the thinking wasn’t there, but I saw the potential, and I’ve seen that over the last few years really come to fruition. It’s not just another software delivery model. It’s not just I’m building a piece of software that people can log into on the web. That’s table stakes. That’s just the way it is. Lincoln Murphy: It’s how do we take that and benefit from all of those people using the product? If I as the vendor can push my knowledge, what I understand about this industry, out to my users, those users and customers benefit from that and feed the machine, and then I can roll that back out. Lincoln Murphy: Everybody is going to get much better, right? Gab Goldenberg: There’s a virtual cycle. Yeah. 100%. I’d like to go on to another case study you shared with me. Just give me a moment to pull it up. There were a few, actually, about onboarding, and basically giving people those better experiences. I think that talks more about what we’ve been doing now. Just from the after we purchased perspective, right? If I understand you, when you’re talking about onboarding, this is not the free trial. This is onboarding for the people who have already made the first payment? Lincoln Murphy: I think the examples I gave you were actually … These were free trial onboard. Lincoln Murphy: The thing is, it’s a little bit … If you do a free trial correctly, if you go about it the right way, that actually is the onboarding process. In other words, my goal isn’t to get you to evaluate this product. My goal is to get you to use it during the free trial. I have to think of it as literally part of your onboarding process to becoming a customer. I think that right there is a disconnect with how most companies still think of free trials, unfortunately. They think I’m going to come in, kick the tires, play around. Once I’ve decided that this is good, I’ll buy from you, and then I’ll start the process. Lincoln Murphy: The best companies start that process during the trial. When you sign up, I assume you’re going to become a customer. Lincoln Murphy: I’m going to get you to actually use the product. That’s what these are. Gab Goldenberg: Tell us a bit about some of the more original, the more creative things you’ve done with onboarding. What can other SaaS companies learn from your experience? Lincoln Murphy: Sure. One that I sent you is Project Bubble, which is a project management tool. The founder of the company reached out and said, “Look. We are at very, very low even activation rate.” Once they signed up for the free trial, validated their email address, went back into the app, almost 100% of the people at that point would drop off. Gab Goldenberg: Wow. That’s fatal. Lincoln Murphy: Right. We knew it wasn’t an email … I’ve seen companies that had their email validation process set up in a way that almost always failed, so people weren’t even able to validate their email address and therefore weren’t able to get into the app. All of that was working. We looked at the data. We looked around at what was available, and we really couldn’t figure out what was going on. We had the founding team basically sit down with a live chat, and everybody that came in, they would ask a couple of questions. I didn’t answer your question earlier about what questions to ask. In this case, we wanted to know number one, what product were they using before they decided to try Project Bubble. Number two, what’s wrong … I don’t remember exactly what the wording was, but basically what could be improved about this onboarding experience? Lincoln Murphy: That was it. Had them do that for a week, just sit there and talk to customer, talk to new sign ups. Then we went back and asked people that didn’t complete that, that basically dropped out before they really were even onboard during the trial. Pulled all that information together, and found that pretty much 100% of people were using Microsoft Project. Gab Goldenberg: Okay. Wow. That’s amazing. Lincoln Murphy: Number two, they couldn’t figure out what to do. They didn’t know what to do. It turns out, Project Bubble is one of those … The founder followed best practices around project management, but Microsoft Project didn’t. Gab Goldenberg: So people’s workflows were based on the Microsoft funny way of doing it. Lincoln Murphy: Knowing that …. This was the hack that I think I said in the list that I sent you. Basically said … I did a little popover that said, “If you are coming from Microsoft Project, click here to get started.” Then it would take them to the appropriate place to get started. That basically almost tripled conversions in the first 30 days. Gab Goldenberg: That’s awesome. Here’s a virtual high five for you. Lincoln Murphy: Yeah, thank you. It’s one of those little wins that … We wouldn’t have known that if we hadn’t talked to the customers. We could have gone back, kept adding features, adding functionality, doing all this stuff that would have been a big waste of time. It never would have been found, right? Talk to your customers. That’s a neat result. I’m super proud of it, but at the same time, it was a little thing. Once the hack was working and we knew that that was really the issue, then you go back and you actually re-engineer the user experience so that it’s not so hacky. Lincoln Murphy: It looked fine. Gab Goldenberg: It just works naturally, like they don’t need to click somewhere special if they are coming from Microsoft Project. It just naturally … That’s the main flow or something. Lincoln Murphy: Right. To take a step back, the lesson there is most of the time in a free trial … I would say this. Free trials don’t convert prospects to customers most of the time, because they’re not designed to. Lincoln Murphy: You have to design your free trial to convert. Really, the biggest problem is that free trials are usually not even designed at all. They dump you into the product, and you either suffer from blank page syndrome, where you don’t know what to do because there’s not anything to do, or you’re overwhelmed with so many options, that you just quit, right? Lincoln Murphy: If it takes three or four clicks to get the customer to the first place that they need to go, just put them there initially. Gab Goldenberg: Oh, smart. Right. Lincoln Murphy: Think about this from the customer point of view. The pushback I usually get is there are so many things that our product does. We need to be able to show them all these different things. The reality is you’re going to show them so many different things that they’re not going to do any of it, so they’re going to miss all of it, and they’re going to leave. Gab Goldenberg: Right. They are going to be overwhelmed by choice. Lincoln Murphy: Exactly. Go back and think about it from your customer’s standpoint. Another example that I shared was Kajabi, which allows you to take your content and basically sell it online. I can take content that I have and create a course or something, right? Well, they came to me and said, “Look. We’re getting a lot of signups.” They’re big in the internet marketing space. They have a lot of affiliates and a really big following. Lincoln Murphy: They’re very trusted advisors in that world, so when they put this out there, a lot of people signed up. Then a lot of people bailed because they couldn’t quite get started. Lincoln Murphy: We started digging through, and again, talking to customers. Looking at the feedback, because a lot of customers that churned out left some feedback. They didn’t churn out. They didn’t even sign up. They didn’t become customers. Gab Goldenberg: A word written. Lincoln Murphy: Didn’t even have content. They didn’t have really even an idea of what they wanted to do. Then in the middle, there were those folks that had some content. Lincoln Murphy: They weren’t quite ready yet. Lincoln Murphy: The ones that were ready to go, those were the ones that were converting, because it was easy. Lincoln Murphy: The other two actually made up the majority. Lincoln Murphy: What we did is said, okay. When you come in for the first time, let’s get you to self-select, self-identify. Gab Goldenberg: Oh, okay. Segmentation. Personalization. Lincoln Murphy: Exactly. From the very beginning, right? I have my content. I’m ready to go. I just need to upload it and start selling. Click. Okay. Now they are to the point where they can start realizing value quickly. Those that have some, we’re going to need to probably help them shape it. We need to give them some help, so we send them through a course and help them pull together what they already have. Lincoln Murphy: Manage expectations, also. This isn’t going to be an overnight thing. Lincoln Murphy: Right? You’re not going to be able to sign up and get started, but if you follow this over the next 30 days, you’ll be good to go. Gab Goldenberg: Right. And see who signs up. Lincoln Murphy: Start collecting leads … Yeah. There’s your three entry points, right? Lincoln Murphy: They went about 600% increase on conversions in the first 30 days. Gab Goldenberg: That’s such a win. Lincoln Murphy: That’s pretty awesome. Lincoln Murphy: It’s just one of those things where we just have to think about it, again, from the customer’s standpoint and understand that not all customers are the same. Lincoln Murphy: We need to make sure that we’re not treating them all the same. Lincoln Murphy: There’s various ways to do that sort of segmentation. That was, I think, a pretty awesome example, and there are some extremes there, right? From people that are absolutely ready to those that weren’t at all, and still being able to figure out a way to help all of them. Gab Goldenberg: Yeah. That’s fantastic. Actually, I was just interviewing these guys, Barry Buckman and Fran Jacobowitz. They’re e-commerce marketing guys here in Israel. They did a similar thing with localization to personalize, right? When they spoke to their prospects in city X and said get service A in city X, then conversions just shot up. Similarly for a furniture store in a particular state, when then they gave them coupons for in-store traffic, they just drove so much foot traffic to the store, the sales went bananas. 100%. Gab Goldenberg: They’ve forgotten further down. Gab Goldenberg: Wow, that’s great. Lincoln Murphy: … and treating that part of the product as not just functional onboarding, but really part of … You’re not a customer until you’re a customer. Then, by the way, I need to work to keep you a customer. Lincoln Murphy: I can’t just rest on my laurels. Gab Goldenberg: That’s right. That’s right. That’s right. I’d like to ask you if somebody wants to learn more about, first of all, your consulting services … Sixteenventures.com for all of you guys watching and listening in … what are some of the different service offerings you can help people out with, right? If we’re talking about segmentation, what are some of the different audiences that come to you? What are some different ways you help them out? Lincoln Murphy: Yeah. These days, I have two full-time jobs. I have Sixteen Ventures and my consulting company, and I also work with a startup called Game Site, which is a customer success management product. I spend a lot of time helping companies with customer success, just understanding how to incorporate that into their organization. Really, if you go to sixteenventures.com, you can see that I write a lot about pricing and growth hacking and just other customer acquisition subjects. Gab Goldenberg: Sure. Free trial optimization. Right. Upsells. Lincoln Murphy: You’ll start to notice a theme. The theme really is customer success. It’s this idea … Like I said, when customers achieve their desired outcome through their interactions with your company, which means customer success spans the entire customer life cycle, including the very earliest touch points with the customers from your sales and marketing all the way through conversion and then onboarding across the entire life cycle. Lincoln Murphy: It’s important to really understand those things. I say go to sixteenventures.com, consume everything that I put out there. Basically, what I do is I work with companies, and then I write about it. I just have to get that stuff out of my head. I take clarity calls every once in a while, which are if you really need some immediate help, that’s the best way. In terms of consulting, I work with companies mostly on a strategic basis. We can get tactical, but I like to work with companies that have resources to be able to take action on what we come up with rather than having to go out and find a team myself to help them. Lincoln Murphy: Sixteenventures.com or follow me on Twitter at Lincoln Murphy. I think what I share … And I share so much stuff, that hopefully some of it would be able to help you. Gab Goldenberg: Yeah. I’d just like to reiterate for anybody watching. I’m a devoted subscriber to Lincoln’s emails. The guy’s got so much valuable knowledge to share, it’s really fun. If I can ask you, Lincoln, all of us learn, I think, from reading one another’s stuff. If you want to suggest some other people I should interview next, who would you give a shout out to? Gab Goldenberg: Two or three guys, girls. Lincoln Murphy: I mean, Steli from Close.io, if you’re talking about sales or … Gosh. I’m drawing a blank on everybody. Gab Goldenberg: Close.io? Okay. I’ll speak to them. Lincoln Murphy: Yeah. Steli is the man. In terms of sales, I think there’s a lot of guys that I … Oh. Heather from Salesfolk is amazing in terms of sales, and she really focuses on cold email, but just the way … Everything that she says around conversion optimization, I think would apply. Lincoln Murphy: Yeah, man. Let me think. Gab Goldenberg: That’s great. That’s great. I can focus on Steli and Heather. Thank you. Yeah. That’s super. Gab Goldenberg: No, that’s super. Thank you so much, Lincoln. You’ve been really amazing. Thank you. Let’s be in touch soon. Lincoln Murphy: Absolutely. Thanks for having me, man. Gab Goldenberg: Sure thing. Take care. What are your favourite Saas techniques? Share in the comments :). In this guest post by Barry Buckman of Ecommerce Innovators, Barry shares how they used a geographically-targeted popup to offer a coupon, and the incredible results they got for their client. No matter how engrossed we are with our computers, smartphones, Google Glass (hey, it’s making a comeback), and other tech, there are still going to be certain products that we as a society will prefer to purchase in person. In a real, honest to goodness store. Just like our ancestors did a million years ago, in the 1980s. One obvious example of this is home furniture. Before you lay out hundreds of dollars on a new couch, there’s a good chance you’ll want to actually sit on it for a minute or two to make sure it’s comfortable. The challenge the client brought to them: There was nothing at all which triggered users to get up and go visit the store. We were recently approached by a regional furniture store chain who wanted to use digital marketing to drive traffic to their physical stores. They are an established brand, and already had decent web traffic, but a simple look at their website made one thing clear: This was an ecommerce site, through and through. Home page leads to category page. Category page leads to product page. Product page leads to shopping cart. In other words, we were getting the right type of traffic to generate in-store visits. We just needed to get the website to encourage them to do so. Now that we knew that our site visitors were in fact interested in making an in-store purchase, we looked for a way to drive them to take that action. We came up with a simple solution which turned out to be extremely successful – a popup (aka lightbox) which offers a 10% coupon, good for in-store purchases only. You bet! We saw immediate results. 13.44% of users who saw this popup converted! If you’re enjoying this case study, you may also want to check out my video interview with Barry (and Ecom Innovators’ CEO, Fran Jakubowitz) in which we discuss this and three other case studies where they got killer ROI for their clients. Good results? Yes. Good enough? No. We wanted to push the envelope a little further, so we created a test variant which we lovingly refer to as a “Passive-aggressive popup”. You’ve probably seen these. Instead of an X button which allows you to close the popup, these require you to click on a line of text which tells you what you’re missing out on by not converting. In this case, we made users click the words “No thanks. I prefer to pay full price”. The result? Conversion rates jumped all the way to 22.2%. That’s a 65.17% conversion rate lift! Then, when the holiday season came around, we stopped promoting the 10% coupon, and instead promoted holiday deals where you could save “Up to 75%”. This temporary change has resulted in conversion rates jumping jump to 28.67%, which is a 29.14% lift relative to the second popup, and a 113% improvement over the original! Popups have gotten a bad rap, but they work really, really well. Their bad reputation is based on dot-com-bubble-era annoying popup ads that came up randomly and offered no value. But if you’re giving people what they want (and hey, who doesn’t want a discount? ), your audience will respond positively. You can use on-site actions to drive off-site behavior. But if you want to drive foot traffic to your store, make sure your website triggers people to do just that. Don’t assume that they will without your encouragement. Without an incentive to do so, they probably won’t. Passive-aggressive popups (I would love it if this becomes an industry term!) work….if you tangibly explain what users would be missing out on by not converting. . In this case, the dismissal text made that painfully clear: “No thanks. I prefer to pay full price.” But I’ve seen cases where the dismissal text on a whitepaper-download popup is “I don’t want to learn more”, and that’s obviously less compelling copy. Barry Buckman works for Ecommerce Innovators, who offer a full suite of digital marketing services, amongst which relevant ones to the above case study are conversion rate optimization and local SEO. During a talk with Barry Buckman (LinkedIn, Inbound, Twitter) and Fran Jakubowicz (LinkedIn of Ecommerce Innovators, I had the privilege of hearing about 4 different case studies where they delivered ridicously high ROI to clients. Amongst the most remarkable were campaigns where they used simple personalization – things that you can easily copy for your own campaign – to double conversion rates in one case from 6% to 12%, and get them from a low single-digit percentage conversion rate to a stratospheric 25% of visitors turning into leads in another case study! FYI, they also generously offered viewers to get a free consultation on SEO or CRO. If you liked this, you should check out our case study documenting how they drove massive foot traffic using online coupons. First of all, the guy has Dale Carnegie’s “how To Win Friends and Influence People” techniques down pat. He listens keenly, he arouses a strong desire in his team to work hard, he’s hearty in his approbation… the man has people skills and is going very far. You heard it here first. In addition to that, he’s a very skillful SEO, knowledgeable in the latest algorithm changes and the intersection of search and social, not to mention link building techniques and more. And the very lucky folks at Creative Campus in Melbourne are getting the privilege of hearing him speak! So we discussed all these topics – motivating a team of SEOs, building links, Google’s Hummingbird, speaking and certainly networking – in this engaging video chat. I only hope that next time we’ll get his webcam working! If you like this interview, you may also enjoy my interview with Wordstream’s Erin Sagin on creative, new-data-backed tips for mobile PPC and retargeting. I had the pleasure of interviewing Erin Sagin of Wordstream. She’s a brilliant marketer that’s having a big impact in managing Wordstream’s PPC clients accounts, and was kind enough to share some gems on mobile PPC and retargeting. She shared pearls of wisdom that aren’t just based on opinion, but objectively gathered statistics that really impress you with their meaning. Here’s the video, see below the vid for some highlights of what you’ll learn by watching. For example, did you know that about a third of mobile website visitors would click to your desktop site if given the option? That’s what they found in a test across three clients. The conclusion: offer the mobile app (it’s typically done on a higher production value than the mobile site) to those visitors, as a temporary band aid until you fix the mobile site, or likewise use click-to-call campaigns with no horrible landing page to ruin the conversion. Similarly to that, Erin’s got some striking stats on what’s really happening with people’s retargeting ad fatigue, impression caps and more. If you liked this, you may like my talk with David Pagotto on how he’s motivating the SEO team he leads to greater productivity, new Google algorithms etc.